Made from natural citrus oils and vegetable oil derived emulsifiers to be environmentally friendly. Ideal damp mopping solutions for all surfaces. 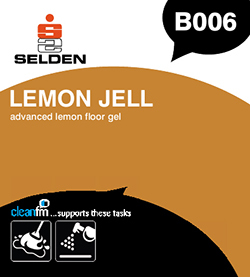 Economical maintenance for polished floors - will not remove or dull polish film at recommended dilution Readily burnished to a slip resistant shine. Perfect for spray cleaning, removes dirt and heel marks with ease. For the regular cleaning and maintenance of linoleum, PVC, rubber, sealed cork, sealed wood, terrazzo and thermoplastic floors. N.B Do not use on unsealed wood and cork. Composition A aqueous blend of polyethylene wax emulsions, detergents, perfume and dye.